The 34-Piece Combination Wrench Set is constructed on alloy steel for strength and long-lasting use. The finish provides resistance to corrosion. The chamfered lead-in offers quick and easy placement onto the fastener. The 8 Piece Full Polish Combination Wrench set offers a variety of metric combination wrenches for any user need. These wrenches have a long panel design to provide more reach during use and the ability to apply more torque to a fastener. These wrenches also have DirectTorque; technology to help prevent the rounding of fasteners. A quality set of combination wrenches is the backbone of any toolbox, especially if you use them for a living. 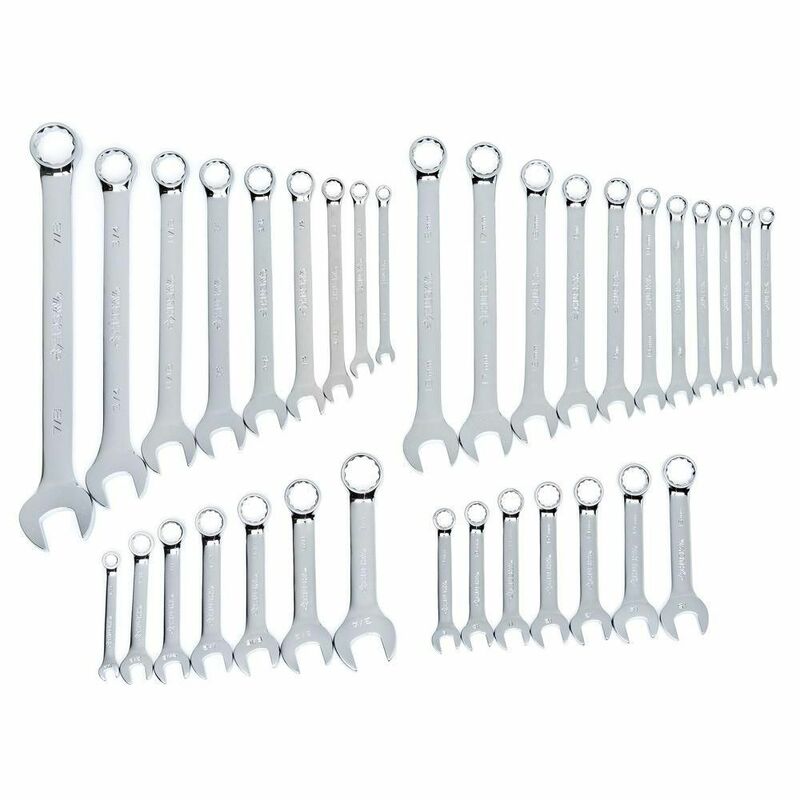 This 14-piece set of SAE-size combination wrenches, with an open-end wrench on one end and box-wrench on the other, offers both professionals and advanced DIYers alike a quality selection of the most-often used sizes. The chrome-vanadium steel construction makes these wrenches strong and durable, while heat treatment provides consistent hardness. Thin-walled design makes using these wrenches in a tight spot easy. This strap wrench set includes a 4 and 6 wrench. They feature a cushioned grip for maximum comfort and heavy duty construction. The strap will not scratch or damage surfaces and can grip, loosen, or tighten almost anything. It adjusts to fit any circumference or irregular shape and eliminates clearance problems. Husky Deep Offset Box-End Wrenches have a 40 offset providing additional access to hard to reach fasteners. The 12-Point double box-ends have chambered lead-ins that help to guide the wrench onto fasteners for quick and easy placement. Each wrench has the added benefit of having 2 sizes in just 1 wrench. Mix Combo Wrench Set (34-Piece) The 34-Piece Combination Wrench Set is constructed on alloy steel for strength and long-lasting use. The finish provides resistance to corrosion. The chamfered lead-in offers quick and easy placement onto the fastener.